The day started out in beautiful sunshine in preparation for our long journey ahead, we gathered in the hall of the Pagoda centre and soon set off for Caernarfon, working our way along the northern coast of Wales with the sun shining on our faces and with the sea to our side. 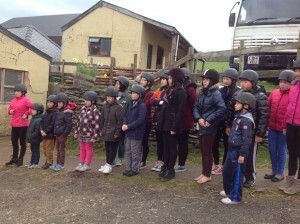 Our younger members cheered as they saw the traditional Welsh wildlife, the humble sheep, in the fields accompanied by rolling spring green pastures. Through mountain tunnels and over ancient bridges, we first took a small detour to the isle of Anglesey to deposit some of our luggage and refresh ourselves for our performances later on in the day. It was the first time off the coastal road and the first time we’d seen civilisation. A few of our boys said they were amazed that people actually lived in Wales and it wasn’t just full of fields and animals! A few turns through the town and we were at the lovely cabins, where we were met by chickens and rabbits, whom the kids took a liking to, not hesitating to snap a few pictures of their new friends. With the heat of the afternoon on our backs we set off once more, we crossed the Menai Strait, heading to the Galeri in Caernarfon which would host not only us for the event, but a variety of performers from all across the globe that had come for the competitions the performances. The festival would be an amazing place for our orchestra, particularly the younger of them to become embroiled in the spirit of music and also to appreciate the harp which is synonymous with traditional welsh music and expand their minds into the endless possibilities of sound. Upon arriving, we set down in a practice room to check and tune our instruments and make our final preparations for the melodic adventure ahead. First on our agenda was to prepare our powerful quintet, who were contestants for the world music competition. Our troupe including the orchestra, parents and volunteers sat in the crowd watching various other worldly artists perform their art for the competition. 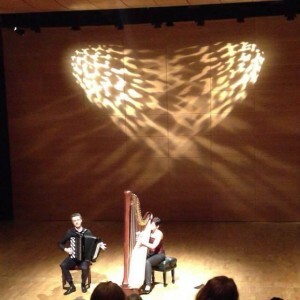 The contestants displayed a unique blend of the traditional harp and less traditional instruments such as a stellar duo with both harp and an accordion and a young trio from America who played harp, banjo and even at one point accompanying both with a set of spoons. After their time in the spotlight, it was then the turn of our quintet, who performed a number of songs most expertly, bringing a unique Chinese flair to the room and captivated the audience with their sounds. After dinner it was the turn of our orchestra to prepare for a full scale musical assault, donning their costumes and heading down into the backstage, nerves were kept controlled though their faces betrayed nothing more than their determination and commitment to the show ahead. Before the orchestra was to head out, there was the winner of the young people’s competition with a wonderful piece on a small harp and after a warm introduction from the host, the orchestra approached their chairs and released their full musical dominance onto the audience, mesmerising them with rendition after rendition that carried throughout the entire hall. 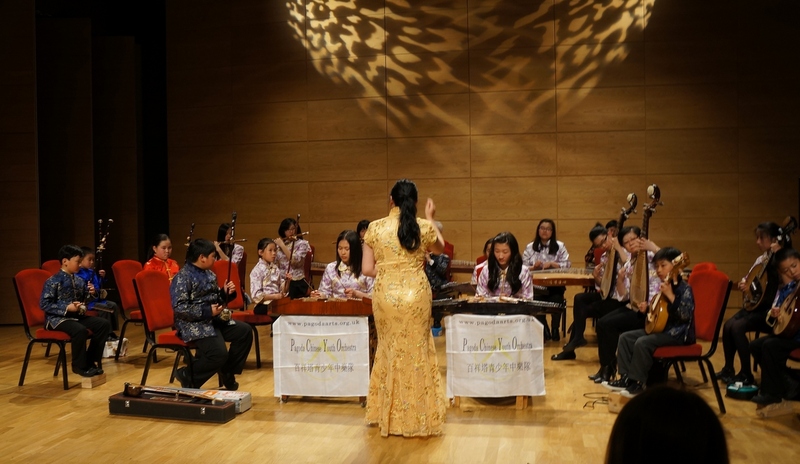 Our show was conducted by our Director Zi Lan Liao whom even took the time in between songs to show off the capability of the Chinese instruments which many in the audience had not seen or heard of before. The performance ended in a crescendo of applause and humble bows from the orchestra as one of our young members thanked them all in welsh. Not soon after it was time to head back over the strait to the isle of Anglesey where we would lay our heads for the night. After an unparalleled performance, everyone was unsurprisingly animated throughout the night before finally succumbing to the fatigue of the day and heading off to sleep. 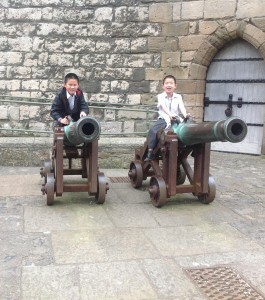 In the morning, we trooped off on the coach to an extraordinarily exciting venue: Caernarfon Castle. 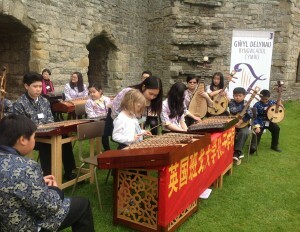 The younger members of our orchestra were over-awed at the castle as we parked up alongside the magnificent structure. Some remarked they’d never seen a castle before and more remarked they wanted a house just as big when they grew up. After a brief setup on the grass up against the ancient walls of the castle, we lay in wait for the BBC’s news crew to approach as they wanted to feature us on their show airing that very night. Needless to say everyone was incredibly excited at this and performed a range of songs expertly even under the steely gaze of the cameras. Some of our members even gave interviews wherein they explained their instruments for the watchers including our member Daniel who exclaimed, elated, that he felt like a rock star! Once the performance was over, members of the public came over to learn more about the instruments and how they worked, it proved especially popular with children although some were too small to play and had to be lifted to do so. After they’d had their fill, we headed back to the Galeri, whom were to host us once again for a day of competitions. Our volunteers and staff took a small group out to explore the city of Caernarfon while the rest remained behind to valiantly encourage the competitors on the stage. The expedition of young Liverpudlians led all over the city, learning about Wales, the castle and the culture surrounding them all, even if everyone was eager to explore the castle once again, they couldn’t get enough! 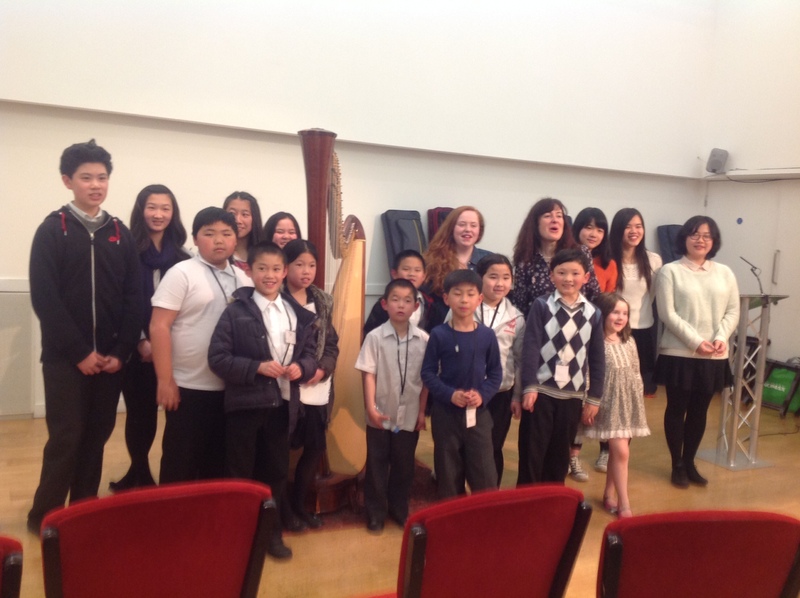 After they got back and the competitors exhausted their awesome repertoire of songs, we were treated to an extra special talk from Rhiannon, the daughter of William Mathias, the renowned Welsh composer and pianist, whom has a music centre dedicated to the highest calibre in the Galeri. The talk was extraordinary, featuring questions from the members both serious and silly. She was great with the children and answered every question with a smile, to which the orchestra adored her. As well the talk we were treated to a rendition of William Mathias’ Harp sonata by a wonderful harp player by the name of Mared. We learned much about the legend that was William Mathias, such that his dedication to the art of writing music was second to none and that he loved children, an aspect which most assuredly lives on in his daughter. After thanking everyone at the harp festival for hosting us and the staff at the Galeri for supporting us, we once again bustled on to our next location, deep in the heart of north Wales. 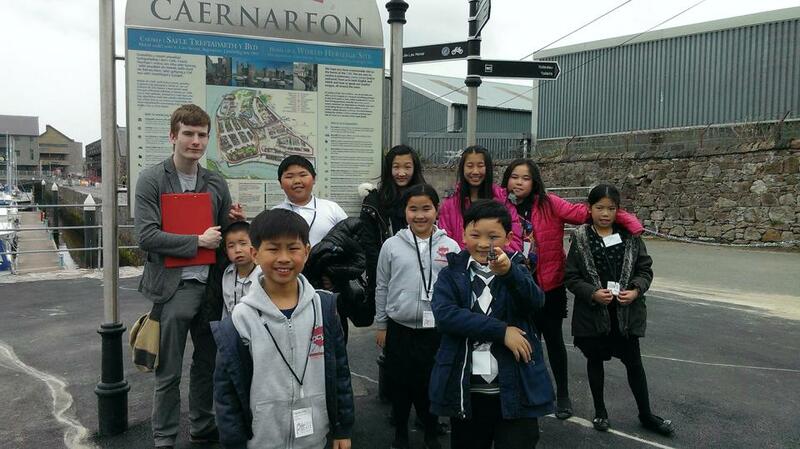 En route once more, we headed away from our exciting adventure in Caernarfon into a bigger adventure in St Asaph. As we arrived, the weather met us head on, drenching us lightly with soggy greetings as we departed the coach a little way away from the house that would host us and headed off in a pair of minibuses with our belongings in tow. We were greeted by brothers Mitch and Dave, retired army veterans with amazing stories to share and who’s driving skills got us through the narrow roads and slippery weather and down into the heart of the Valley where we would be staying, Dolben Hall. Not long afterwards, Dave suggested we journey outside across the river where he would go on to take us on a tour of the phenomenal scene that encompassed the house, which dwelled inside its own private valley. We trekked along the far side of the river, one of our members, Kelly, having more sense than the rest as to wear plastic bags on her shoes. More of us regretted not doing the same as the trek began to get increasingly muddier as we went on. This was soon forgotten however as we walked between fields of wild garlic while entranced in the tale of the Peregrine falcons who’d made the cliff faces their homes. Dave led us to a hut he built with his own hands based on a Norwegian design that he’d mastered on his many travels. He used only fallen timber and it took him weeks. In the dark the children made ghost noises and dared one another to sing. But we then left the dark yet strangely comfortable home-made hut and left to explore the nearby cave. We were told about how millions of years before, a great river had carved its way through the rock and we could see the evidence far above our heads as it had etched its path through the un-hewn stone. As we made our way back Dave requested us to test his bridge by everyone joining hands and jumping at the count of three, everyone jumped and cheered and unsurprisingly the bridge held our weight, we jumped again and our cheers sent echoes throughout the valley! In the morning, breakfast was served to a temperamental morning sun as the kids explored the grounds, accompanied by an elderly gun hound and trailed hopefully by a mare at the fence of the grounds, eager for any opportunity to be rewarded by the greener grass on the other side. Two trips via the medium of minibus later; we said our goodbyes to Dave and Mitch and headed even deeper into the glorious vastness of North Wales. 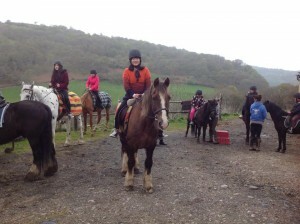 Dave and Mitch had prepared a day of horse riding for us with some of their friends. Greeted by both wind and rain the orchestra awaited their steeds. Some were bold and confident and mounted without fear or trepidation. Others were not quite so bold, being their first time ever being near a horse. 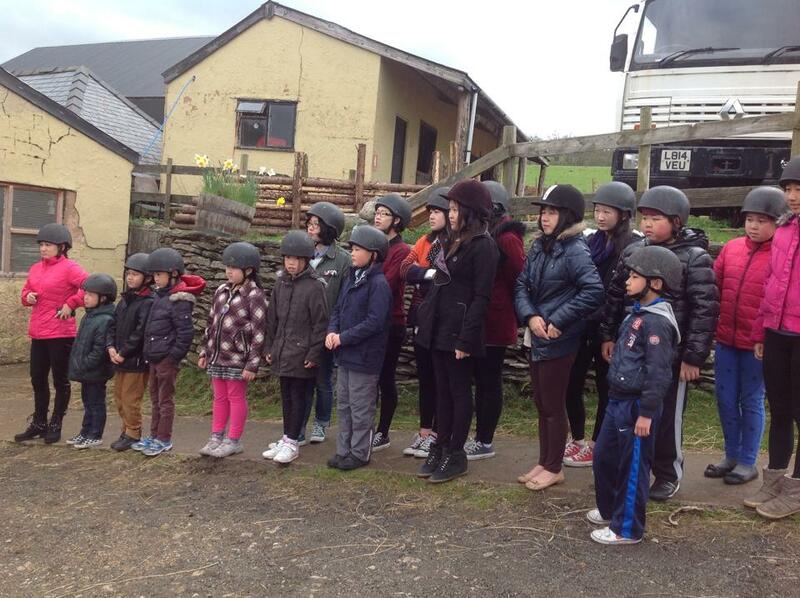 Equipping their protective helmet they were treated to a safety lesson on riding, told how to mount and dismount and had their steeds led to them. Of course, every member is different; some had smaller steeds while some were granted grander ones, our two youngest members had the smallest steeds and rode out in front, a vanguard of cuteness. All in all our orchestra slowly transmuted into a cavalry, primed to take the welsh passes by storm. Fortunately, by the time we set off, the quiet storm had passed and the sun came back strong on the riders. After a walk through the glorious, if somewhat soggy, overgrowth of the lands we came out the other side back to the others who awaited us with glee. The long ride had shed all fears of some of the less certain riders, they strode their steeds back to the yard with certainty. Thanking the stable-hands, we climbed the steep roads in the roaring sun back to our coach with our final destination in mind; we had a lot of fun and had a grand adventure among the whimsical Welsh lands but alas, it was time to head home, back to Liverpool.